walter nomura: Bull of the year 2008 - Congratulations, brazilian team ! Bull of the year 2008 - Congratulations, brazilian team ! Parabens a equipe brasileira que ganhou o Bull of the Year 2008. O premio Bull of the Year é uma competicao interna da Red Bull, que premia a melhor equipe da Red Bull no mundo inteiro e que teve como vencedora a equipe brasileira neste ano de 2008. Estes shapes fizeram parte desta premiacao. Criados exclusivamente para a equipe Red Bull do Brasil, e tem uma serie numerada e assinada pelos artistas(Tinho, Sesper e Flavio Samelo). No caso o shape feito por mim, teve uma serie de 50 copias. Congratulations to the brasilian team who win the Bull of the Year 2008. The Bull of the Year's award is a internal competition of Red Bull and award prize to the best Red Bull's team around the world and in this year 2008 had as a winner the brazilian team. 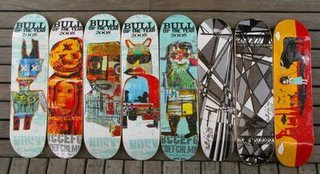 These decks were part of the award. Developed exclusively to the Red Bull's team from Brasil they are all signed and numbered by the artists(Tinho, Sesper e Flavio Samelo). My one had a serie of 50 pieces.